Let me take you back in time to when I was 12 years old and entering Menarche in a small Swiss country town. My first bleeding was nothing dramatic nor was it celebrated or seen as something special in a young woman’s life. My mother explained to me the hygienic of how to take care of the blood and that was pretty much it. It was little spoken about between girls at school. I was bleeding often very heavily and for long times which eventually lead to a lack in iron and from there to a lack in concentration and a drop in my grades. My doctor and my mother decided that probably it would be best to put me on the pill soon, so my cycle would regulate and become less strong. Since I refused to use tampons for a long time, I felt very inhibited when menstruating. I also remember being constantly scared that my blood would leak through my pants which would make me feel ashamed and dirty. I felt like I am being slowed down and being slow, wasn’t something I liked. I grew up with two older brothers and it bothered me that they didn’t have to deal with something such as menstruation. Of course I knew from school that this is part of being a woman so she later can have babies. But believe me, at that point, babies were far off my radar instead I wanted to go out and explore the world. Imagine for a moment how different my experience of my first blood would have been, if celebrated as a major event and Rite of Passage into my Womanhood; attended by a trusted circle of experienced women. What would it have been like if they had explained to me the power, beauty and responsibility that came with my menstrual cycle and how to use it to my benefit and the benefit of others? How to own and honor it? It would have been amazing to hear that I could use the creative power within me to not only create babies but also workshops, businesses, a garden, a painting, a books or simply whatever I was meant to birth into this world. It would have been a huge gift. Fast forward to January 2013, when I met Sara Avant Stover during one of her Women’s Yoga Teacher Training. Sara spoke very openly about menstruation and at the time was announcing an online course called Reversing our Curse. I was intrigued because ever since I started to bleed, I never really gave much thought to my menstrual cycle; it was just part of being a woman. I signed up for Sara’s course and that’s when I started to learn and hear things about my cycle which I’ve never heard before. I started to not only track my cycle which I’ve been doing for a while but also to feel into how I managed during the different phases of my cycle. How did it impact my energy level? How did it impact my psych and emotions? What was my blood like? How did it feel to consciously bleed? How did I feel during my ovulation? How did it feel to rest during the first day of my bleeding? Did I feel more creative at certain times than at others? Was there a phase where I felt more focused or distracted? Did I experience premenstrual symptoms? Did I have a stronger sexual desire during certain phases then others? I journaled took notes and compared them each month and through that I saw patterns more clearly. After a while I realized that what I’ve been trying to do all throw-out my life was to live a linear life within a cyclical body which on the one hand simply was depleting but even more so, prevented me from hearing my inner wise woman who I need to hear in order to become empowered in my womanhood. Disrespecting my cyclical nature kept me from creating and manifesting that which really matters to me. I was often too busy manifesting things that didn’t really matter but feeling too proud, too guilty and too scared to slow down, to rest, to be, to day dream, to drop in and down and retreating into silence. The creative cycle however demands just that and our female menstrual cycle reflects this beautifully once we start to embrace it. During a one month cycle we journey through the different seasons of Spring, Summer, Autumn and Winter – and each of these phases has its necessity, beauty and right to be lived. 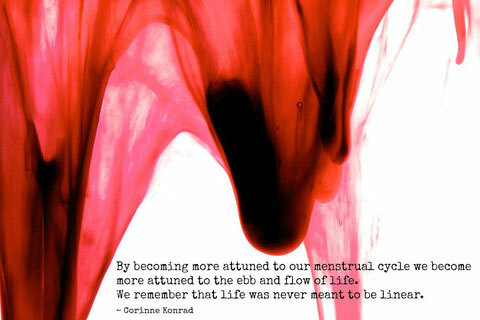 We may notice too that we embody different parts of the feminine at different stages throughout our cycle. By reclaiming our female cyclical nature we start to remember that which often gets overlooked in our fast-past, achievement oriented, never stopping society: That there is an underlying creative intelligence to everything in life and often we need to do half as much as we think we need to and instead relax and soften into that intelligence which already is. A curiosity or an interest to hear more or a longing towards something which is difficult to name but felt deep within your body. If this is the case then I’d love to welcome you in my 2-day workshop on January 30-31, 2016, where I will be sharing with you that which I have come to understand through different teachers together with my own reflection and conversation with the wise woman within. You can find out more about the workshop here.